We have been having some issues with inventory. If the product says it is on BACKORDER it is probably still in stock! Please be patient as we get on top of this and order anyway. If there truly is a problem we will contact you by email. We apologise for any inconvenience. Congratulations! You are poised to find out more about Ocean Derived Sea Minerals, and associated products, and what they can do to support good health. We believe that 'Nature Nurtures' and that most, if not all, answers to Human Health Issues can be found in Nature. Did you know that sea water is almost identical to Human Blood Plasma? Our Sea Mineral products are salt reduced and chock-a-block (for non-Aussies that means "full") with Macro and Trace elements. Whether you need to replace electrolytes, top up your mineral intake, get your at least your recommended daily value of Magnesium, if not more, you have come to the right place. Daily Boost is for you! 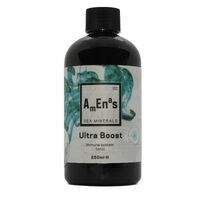 We also have a range of Herbal Sea Minerals that are fortified with well researched traditional herbs to help support good health more specifically; for instance Hawthorn is great for circulation, heart health, regulating blood pressure and has been in use for 100's of years; Ultra Boost has anti-viral and anti-bacterial properties; Nettle (Stinging) is wonderful for the endocrine system and lungs. 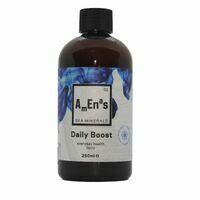 You can read about the benefits of ALL the herbs in our Sea Minerals here. Gerry Amena founded and formulated the Sea Mineral Products back in the '80's so they have been available for more than 30 years now! Gerry had strong beliefs that nutrition is the answer to good health. If you would like to read about his experiences and beliefs around Sea Minerals please read the Acres USA interview here. 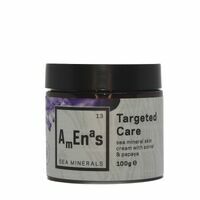 We have skin creams based on Sea Minerals and are also building a range of Herbal Teas to further fortify good health. Please enjoy reading and shopping! Lots of information can be found by clicking on 'Product Information' on the top of the page and scrolling through to find a topic you are interested in. You can also contact us through the 'Contact' page or call during business hours +61 7 5484 6555. We would love to help you!